​Water features can bring a whole new dimension to your backyard pool. From something like a simple laminar to a more extravagant feature like a natural waterfall, the concept of moving water not only attracts attention, but it can make your backyard a relaxing retreat... By incorporating water features into your poolscape, you&apos;ll not only add an artistic element, but more depth and character, as well. 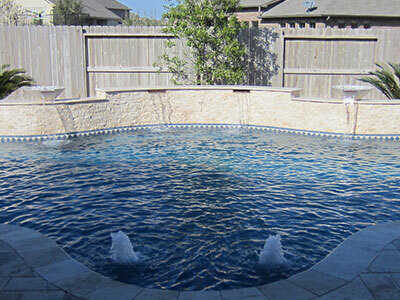 ​Waterfalls make a classic addition to any pool style and are always popular with children. 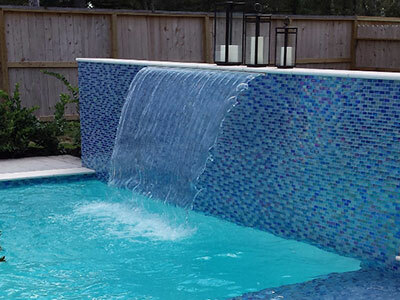 Our custom designed pool waterfalls offer endless design options - from natural rock waterfalls to flagstone waterfalls and spa spillovers can be! ​Bubblers are fun water features that spout up from shallow pool surfaces like steps and beach entries. When combined with the right aesthetic lighting, they can create striking centerpieces to a variety of swimming pool styles. When placed on a beach entry or tanning deck, they create a fun splash pad for small children and big kids alike. ​Deck Jets use air to shoot streams of water from the deck into the pool. 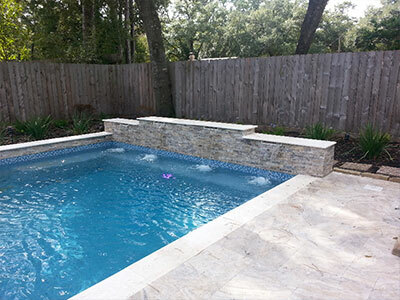 Laminars arc across the swimming pool for an elegant and fun addition to your Houston swimming pool. They make for particularly fascinating water features at night when backlit with LED lights. Your kids will love chasing the glowing water! ​A sheer descent or scupper is a straight, linear water feature that drops a clean, sheet of water into your pool. These water features create a soothing water sound with an elegant, majestic look.